A while back after reading about peer-to-peer lending (or social lending) via a variety of personal finance blogs I decided to look into it a bit more. The idea sounds intriguing. Instead of dealing with big banks who could care less about providing good rates, good customer service or giving you a personal touch, you borrow money from other regular people – all who are lending you as little as $25 a piece. You get a lower rate and they get a better return than the 1.5% offered via their savings account. Everybody wins. While I liked the idea itself, I wasn't sure what the risks might be when engaging in this type of lending. What were the default rates, and what kind of returns could you expect when investing your money? Would it last? There were a couple of main players in the Social Lending arena, among them Lending Club and Prosper. Lending Club was the one that I decided to give a try. Opening an account with Lending Club is a pretty easy process. First, however, be aware that Lending Club and other P-2-P sites are not available in all states. To check the availability of becoming a lender, check out this link. Click on Join Now link at the top right of the screen and complete the application to be a borrower or investor on the screen that comes up. Sign up through us and you should get $25 to start your account! You'll get a confirmation email. Click on the link in your email to confirm your registration. Go back to the Lending Club website and login with your new login info. Click on the Invest button. Fill in your profile information in order to verify who you are, and to link your bank account to Lending Club. (Lending Club will make two small deposits into your account to verify that you have access to the account). Once your bank account is verified, go to the My Account tab, and then choose Add Funds. You’ll need to transfer at least $25 to your Lending Club account in order to get started. This may take a few days. Once you have added funds to your Lending Club account, it's time to start investing! This is the fun part of the process. Just click on “invest” on the navigation bar, and it will take you to the Lending Club automatic “Build A Portfolio” screen. 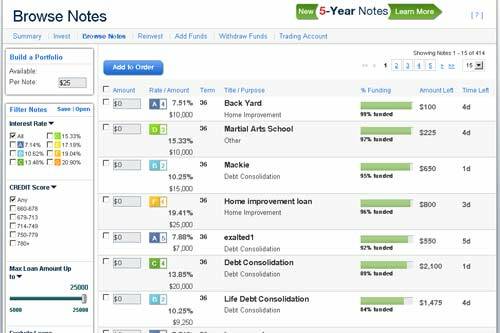 You can either let Lending Club choose loans for you in $25 increments (Using a conservative, moderate or aggressive setting), or you can choose to browse notes manually and select the loans you want to purchase. Choosing the loans can actually be kind of fun. You get to browse through listed loans that are going through the funding process, and fund the ones you feel are good credit risks. If you want you can even choose to ask questions of possible borrowers. For me, I'm a less aggressive lender, so I tend to follow these criteria in the loans I choose. Loans less than $10,000: Lower loan amounts means a lower monthly payment and a lower risk of defaulting on their loan. A & B credit rating: I’ve invested in loans that have either an A or B credit rating (good credit). I've also sprinkled in a few C ratings for flavor. Never anything lower. Zero delinquencies: When you view borrower’s profiles you can see from their credit report if they’ve had any reported delinquencies on their account. If they have, I skip their loan. If they’ve been late in the past or missed a payment – they’re likely to do it again. Debt to income ratio below 25%: I like to invest in loans where the borrowers have a lower DTI ratio. You want to make sure they can afford the loan! Loans over 60% funded: I like to do my due diligence when giving out a new loan. But when enough other people have invested in the loan, that's usually a good sign as well. Borrower answers to investor questions: Lenders can ask borrowers questions before they purchase a piece of their loan. If answers aren't forthcoming, or if the person seems flaky, I skip the loan. So those are some of the criteria I have used to find good loans in my Lending Club account. After lending for about a year it has worked well so far, I haven't seen any defaults on the 35 notes I have bought in on. My net annualized return is currently around 10.30%. That's better than a high yield savings account, and part of the reason I'm adding more money to my account this year! You can also use Lending Club as a borrower. I have read quite a few interesting stories on the personal finance blogs of people getting a loan to help pay off high interest credit card debt, or second mortgages. Usually they do this because they can obtain a better rate through Lending Club than through their bank. I would never suggest consolidating all of your loans into a Lending Club loan unless all the rates are higher than the rate you can get with Lending Club. You can borrow up to $25,000 from other Lending Club users, and the rate you receive will depend on a variety of factors including your credit score. It isn't for everyone, but for some it's a good alternative to the big banks. I've been investing in Lending Club for over a year now, and in that time I've made a net annualized return of 10.30%, and due to my careful lending habits – I've had zero defaults on the loans I chose to fund. Lending club can be a great investment option, as long as you are careful about who you're lending to, are sure to keep reinvesting the funds that you're making. As a borrower it can make sense as well, as long as the loans you're getting are lower than rates you can get elsewhere. If they are, why not? You're then paying interest to individuals instead of a big bank! What do you think of Lending Club? Have you used it as a Lender or Borrower? What have your returns been like? Have you seen any defaults in your account? Tell us your thoughts on Lending Club and social lending in general in the comments. Next Post: If Your House Is Worth Less Than You Owe, Is It OK To Just Stop Paying Your Mortgage And Walk Away?